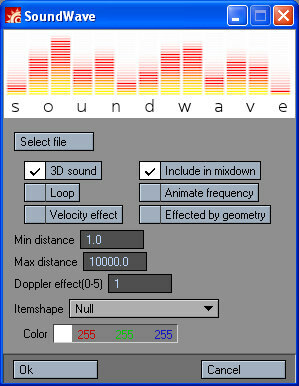 SoundWave let you attach any sound to an item in LightWave 3D. Full 3D sound, surround setups like 5.1 and 7.1 fully supported. Of course it works well with a plain stereo setup as well. If you wish non-3D playback like loading audio into scene editor, uncheck 3D sound checkbox. 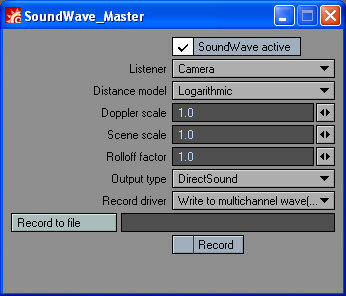 Full 3D sound support with logarithmic or linear rolloff. Geometry occlusion. Just add SoundWave Sound occlusion to an object, this can be animated. Sound will fade behind polygons. Write your sound to multichannel .wav files or record with a input device. Animate volume, pitch & frequency per sound. Available for Windows, 32 and 64bit plugin.